Here's a little homage to comic books I made. I didn't actually like super hero comics that much but they're so iconic! I've always loved comic books though...when I was little it was Harvey (Little Dot, Richie Rich, Hot Stuff, Wendy the Little Witch) and Archie, then as a young teenager ElfQuest, then as a young adult underground comics (Lynda Barry, Peter Bagge, Daniel Clowes). Anybody else like comics? I’ll look for some favorites. Have to post pictures because I’m lucky if I can draw a stick man. I love Betty Boop...Max Fleischer was a genius!! Of course in the old cartoons if Popeye spanks his nephews he stacks them over his knee and hits the top one the effect travels down so you hear “ow” from each one in turn. Betty must have done something terribly bad. Betty was always bad...but never badly drawn! 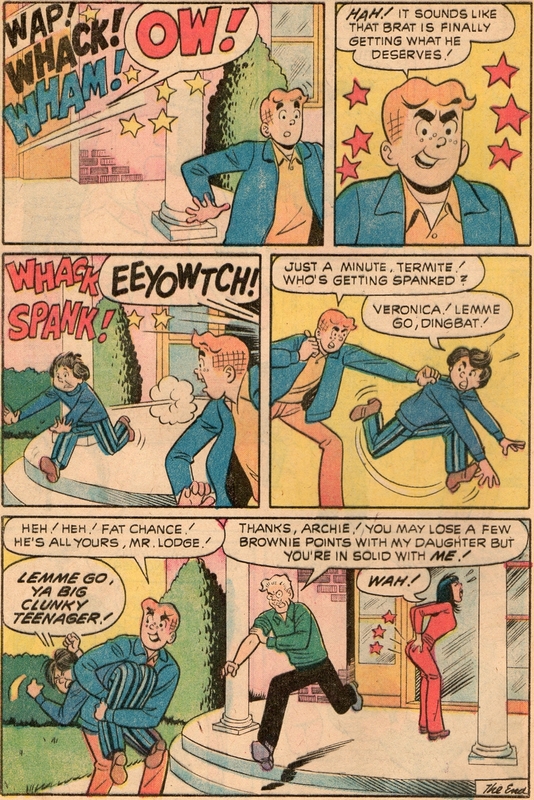 Veronica always seems to be in trouble. I don't think that's an accident! Dan DeCarlo, the archetypal Archie artist, did plenty of ribald stuff when he wasn't on the clock at his family-friendly gig. He may well have been a spanko himself. I never knew that!! What else did he draw?